It's time to travel the countryside in a class C diesel coach. For comfort and flexibility to go everywhere and park anywhere, you will want this single slide out Four Winds Sprinter 24WS. You can sleep a child or two at the 52" x 87" cab-over bunk. 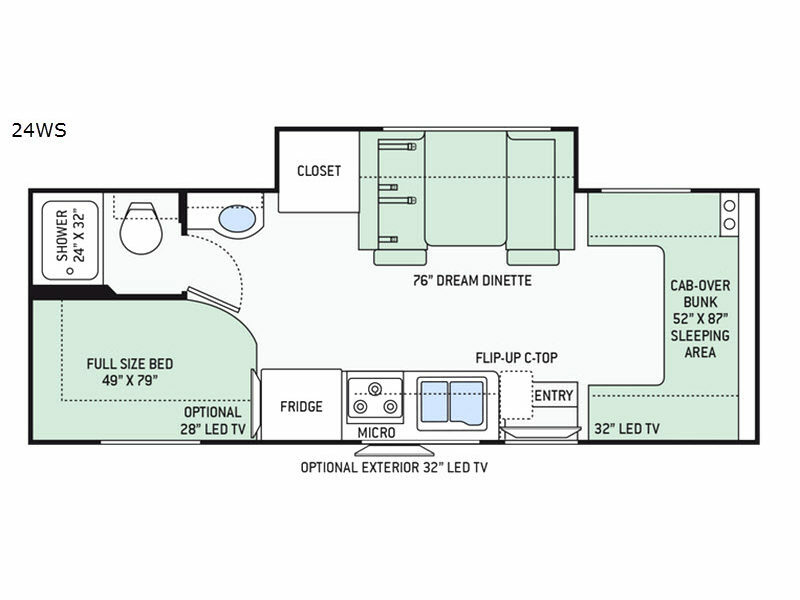 In the rear there is a 49" x 79" full size bed, plus the 76" Dream Dinette easily converts into additional sleeping space. The rear bathroom has a 24" x 32" shower and just outside of the bathroom there is a sink where you can easily clean up! 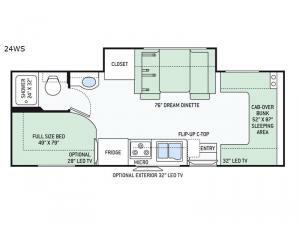 The Four Winds Sprinter provides the freedom that you deserve while setting yourself apart from everyone else! Bringing along all of your necessary camping items is easier than ever since there are plenty of exterior storage compartments. In the evening you will enjoy visiting with your family while sitting under the awning with integrated LED lights. Inside you will enjoy conveniences such as the residential vinyl flooring, laminate countertops, high-sheen cabinets with raised panel cabinet doors, plus you can get a good night's rest on the Denver Mattress. The shower skylight adds plenty of natural lighting, and in the bedroom there is a USB power charging center for your electronics!